Leicester City was not going to win the Premiership—not by a long shot. Nor was the Republican nomination supposed to be handed to Donald Trump. And Bernie Sanders, well, there was no chance he was going to give Hillary Clinton a serious run for her money (and machine) in the Democratic primaries. Leicester City Football Club, as anyone who has even a fleeting interest in sports (or reads one or another major newspaper or news outlet) knows, were just crowned champions of the Premiership, the highest tier of British football, after starting the season at 5000-1 odds. There really is no parallel in the world of sports—any sport, in any country. (By way of comparison, Donerail, with odds of 91-1 in 1913, is the longest odds winner in Kentucky Derby history.) And the bookies are now being forced to pay up. Finally, Bernie Sanders’s campaign for the Democratic nomination was written off almost as soon as it was launched. And yet here is—winning the Indiana contest by 5 points (when it was predicted he would lose by the same number of points) and accumulating enough pledged delegates to be him within a couple of hundred of the presumptive nominee. In all three cases, the presumption was that the “system” would prevent such an unlikely occurrence, and that the pundits and prognosticators “knew” from early on the likely outcome. So, for example, the winner of the Premiership was supposed to come from one of the perennial top four (Manchester United, Chelsea, Arsenal, and Manchester City)—not a club that were only promoted from the second division of British football in 2014 and last April were battling relegation (they finished the season 14th). Pretty much the same is true in the political arena: neither Trump nor Sanders was taken particularly seriously at the start, and along the way the prevailing common sense was that their campaigns would simply implode or wither away. The idea was that the Republican and Democratic parties and nominating contests were structured so that their preferred nominees would inexorably come out on top. There are, I think, two lessons to take away from these bolts from the blue. First, the “system,” however defined, is much less complete and determined than people usually think. There are many fissures and spaces in such systems that make what are seemingly unlikely outcomes real possibilities. Second, our presumably certain “knowledges” are exactly that, knowledges, which are constructed—in the face of radical uncertainty—out of theories, presumptions, blind spots, and much else. The fact is, we simply don’t know, and no amount of probabilistic certainty can overcome that epistemological gap. So—surprise, surprise—Leicester City and Trump won, while Sanders has put up a much more formidable challenge than anyone expected from a socialist presidential candidate in the United States. One of the most studied issues in contemporary economics is the effect of an increase in the minimum wage. 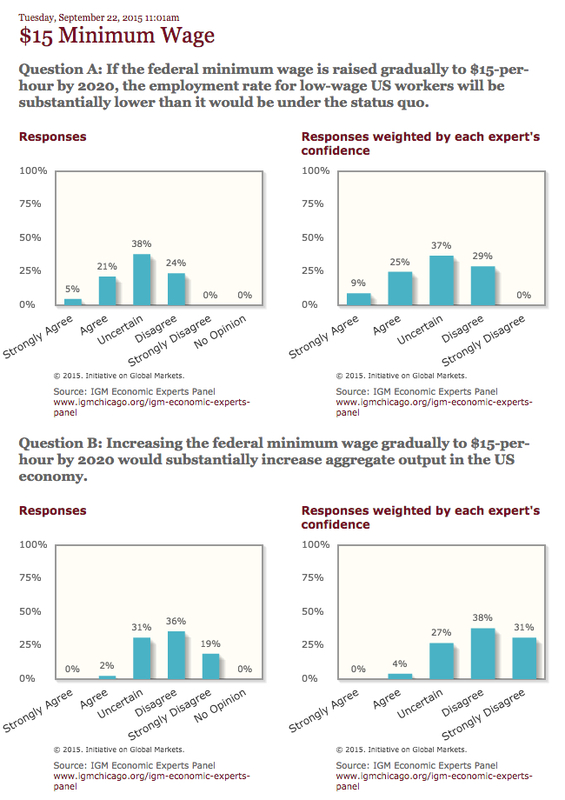 But here we have a panel of so-called experts composed of mainstream economists who are uncertain—about whether employment will decrease or output will increase. Ordinarily, I would applaud a health dose of uncertainty among economists, especially mainstream economists. 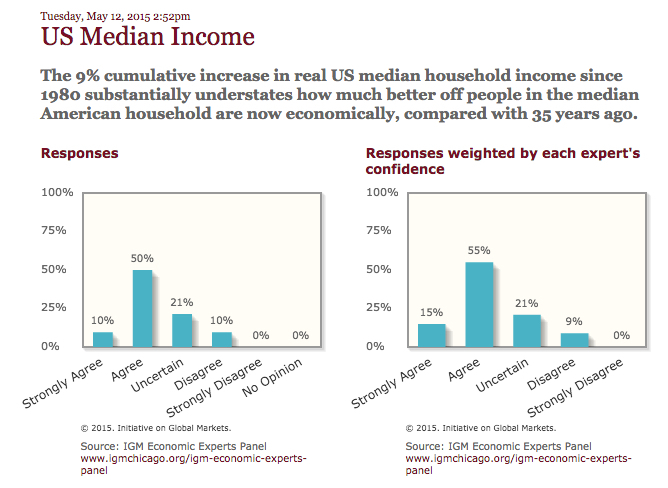 But, of course, mainstream economists show themselves to be quite certain about things other than the minimum wage, such as the idea that the median American household, notwithstanding the small increase in household income, is actually much better off. Until recently, we were certain what would happen with an increase in the minimum wage—and that would be the reason to oppose any and all such attempts. Now, it’s a guessing game—and that uncertainty about its possible effects has become reason enough to oppose increasing the minimum wage. 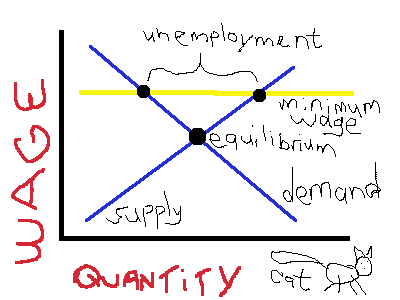 First, the certainty: neoclassical economists confidently asserted that the minimum wage caused unemployment (because it meant, at a wage above the equilibrium wage, the quantity supplied of labor would be created than the quantity demanded). Therefore, any increase in the minimum wage would cause more unemployment and, despite the best intentions of people who wanted to raise the minimum wage, it would actually hurt the poor, since many would lose their jobs. But, of course, theoretically, the neoclassical labor-market model was missing all kinds of other effects, from wage efficiencies (e.g., higher wages might reduce labor turnover and increase productivity) to market spillovers (e.g., higher wages might lead to more spending, which would in turn increase the demand for labor). If you take those into account, the effects of increasing the minimum wage became more uncertain: it might or might not lead to some workers losing their jobs but those same workers might get jobs elsewhere as economic activity picked up precisely because workers who kept their jobs might be more productive and spend more of their higher earnings. And that’s precisely what the new empirical studies have concluded: some have find a little less employment, others a bit more employment. In the end, the employment effects are pretty much a wash—and workers are receiving higher wages. But that’s mostly for small increases in the minimum wage. 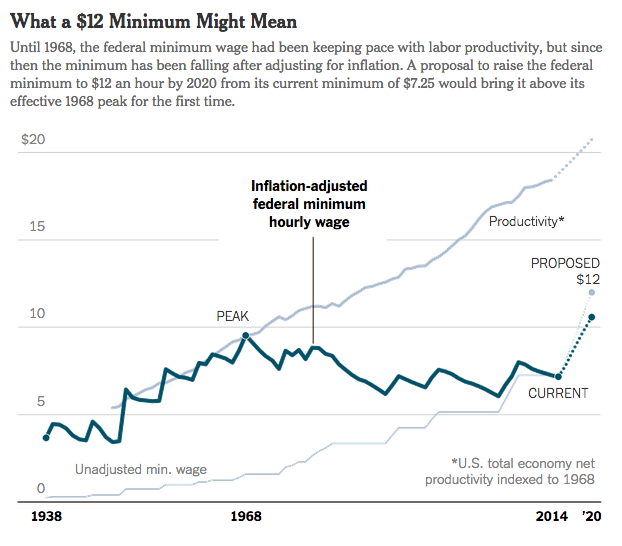 What if the increase were larger—say, from $7.25 to $10, $12, or $15 an hour? Well, we just don’t know. All we can do is guess what the effects might be at the local, state, or national level. But conservatives (like David Brooks, big surprise!) are seizing on that uncertainty to oppose increasing the minimum wage. And that’s what I find interesting: uncertainty, which was at one time (e.g., for conservatives like economist Frank Knight) the spur to action, is now taken to be the reason for inaction. And those who oppose increasing the minimum wage are now choosing the certainty of further misery for minimum-wage workers over the uncertainty of attempting to improve their lot. They want less of a guessing game? Then, let’s make the effects of raising the minimum wage more certain. Why not increase government expenditures in areas where raising the minimum wage represents a dramatic increase for workers? Or mandate that employers can’t fire any of the low-wage workers once the minimum wage is increased? Or, if an employer chooses to close an enterprise rather than pay workers more, hand the enterprise over to the workers themselves? Any or all of those measures would increase the certainty of seeing positive effects for the working poor of raising the minimum wage. But then we’re talking about a different game—of capital versus labor, of profits versus wages. And we know, with a high degree of certainty, the choices neoclassical economists and conservative pundits make in that game.